I had a craving for butternut squash ravioli for weeks now, but haven't had time to make my own pasta dough. So, when I saw Diana's post over at Off the Bone about pasta with pumpkin, I had one of those "aha" moments. Of course! Why not just mix butternut squash with boxed pasta? It's not exactly the same as biting into a toothsome, silky wrapper of home-made pasta and having the creamy butternut squash burst out of it, but it's pretty darn close and a breeze to prepare. Diana's Italian professor, who gave her the recipe, would not approve of my liberal additions to this simple dish, but I couldn't help it. I threw in some roasted portabellas and sage crisped in butter. My excuse for sage was that I needed to use it before it went bad. Can't think of any legitimate excuse for portabellas except that they taste so good with butternut squash. Preheat the oven to 400F and set the rack in the lower third of the oven. Prepare a large pot of water with salt for pasta and bring to a boil while roasting veggies. Cut butternut squash in half lengthwise, remove the seeds, and cut into 3/4 inch slices. You don't have to peel the squash since the skin tastes good when roasted. Season squash generously with salt and pepper, drizzle with 2 Tbsp olive oil and spread in a large shallow baking dish in one layer. Roast in the lower third of the oven for 30 minutes. Flip and roast another 20-30 minutes or until very tender and slightly caramelized. After flipping squash, season mushrooms with salt and pepper, drizzle with 1 Tbsp olive oil, and add to the butternut squash baking dish if there is room or another baking dish. Roast 20-30 minutes so that the mushrooms and squash are done at roughly the same time. Slice portabellas 1/4 inch thick. Cook pasta according to box instructions. While pasta is cooking, set a skillet with 2 Tbsp of butter over medium heat. When butter is melted, add sage leaves in one layer. Fry until they stiffen slightly, about 1 minute. Flip with a fork, and fry until crisp, about 1 minute. Remove sage to a plate and set aside. Turn down the heat to low, add the garlic and cook until golden, about 1 minute. Take off heat and cool slightly, 2-3 minutes. Season garlic butter with salt and add a sprinkle of parmesan. Mix well. 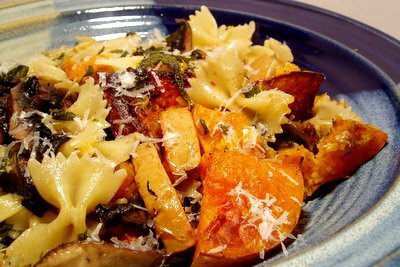 Drain pasta, and mix with butternut squash, mushrooms, sage leaves, garlic-sage butter and additional 1 Tbsp of extra butter. Sprinkle with cheese and serve. Do you have a pasta roller? I saw a hand-crannk one in Crate and Barrel yesterday and was sorely tempted. Not sure how much I'd use it, though. Yes, I have a pasta roller. It's a hand crank variety. It was pretty inexpensive ($40-50) and it works fine except for the part that is supposed to screw it to the counter top (unfortunately, it swivels). But making my own ravioli still takes me couple of hours. Kneeding the dough, letting it rest for an hour while making a filling, fold and roll each piece 6-8 times, thin it out, and then finally fill and trim. Phew! It's a fun and very enjoyable process, but I only go through the trouble about 8 times a year. About pirozhki. I am from a family of cooks too, not really bakers. That's why my baking abilities are so pathetic. I am getting better, but very slowly. For years, I've been using pillsbury dough because that's what my Mom uses. But I've tried making my own dough last 3 times. Third time was the most successful either because I just got better or because I used Julia Child's recipe and she simply rocks! Or maybe it's a little bit of both. If you have the second volume of Mastering the Art of French cooking. Look up brioche dough. That's what I used and the pirozhki came out great! The only thing I did differently, is using the mixer for beating in the butter. Julia's directions are for doing it by hand. Molokhovets has 5-7 recipes in her book some of which resemble Julia's quite a bit, but since Molokhovets' instructions and measurements are somewhat criptic, it's safer to follow Julia's directions. Just found your blog and it's great! I have recently gotten into food blogging myself and was directed to yours from the fabulous simply recipes. I will defintley be trying this recipe at home! Or maybe I'm fooling myself. Either way, I loved it! About the Ravioi dough, I use Won Ton wrapers. I brush them with egg white and put the filling in then lay second wrapper on top. I use about one tablespoon of squash to a ravioli. CAN'T tell the difference and is too fast. they freeze really well too. You really don't have to do all of that work. I used to spend hours making pasta too but it's easier than that now. If you have a decent food processor you can just dump 2 cups of all purpose flour and 3 eggs in and run it for 30 seconds until it balls up. If it's pebbly just had 1/2 tsp of water at a time. Once it's done just knead it for a few seconds until it looks smooth, wrap it in plastic wrap and let it rest for about an hour or two. I found this step to be very very important. You're involvement is all of 2 minutes. I had a $30 wall mart purchased food processor that would bog right at the end. My new Kitchenaide processor chugs right through it. I also retired my hand crank pasta roller because it required two people to work at any speed. I have a kitchenaide mixer so I got the roller attachment and now I can make pasta by myself and it only takes about 5 minutes. To make Ravioli from scratch get ravioli forms. http://www.amazon.com/2-Ravioli-Form-Makes-12/dp/B000UT9GI8/ref=sr_1_2?ie=UTF8&s=home-garden&qid=1213672383&sr=8-2 - There's two different sizes, get both. There's two parts to pasta forms - the rack with holes and the insert you press down on the dough with to make the pockets. I've found that if you put the butternut squash mix in the insert and throw it in the freezer you end up with small half sphere rounds of frozen squash that you can then use to press into the holes. Cover the squash with another layer of dough and cut them using a standard rolling pin. Then you want to throw them into the freezer again and you can use them whenever you want. They're WAY better than store bought and you can experiment with the filling. I season my squash with nutmeg, cinnamon, a hard non-melting cheese and a touch of maple.